Like a surprising amount of historical battlefield weapons, the English bill or "bill hook" owes its origins to agricultural use. This ancient forestry tool was used by peasants to hook creeping vines and hard-to-reach branches, clear foliage and - when necessary - even lop heavy limbs from trees. It didn't take much imagination to see the Fighting applications of this heavy duty tool. As it saw more and more use in combat, the bill began to Evolve into a dedicated fighter. 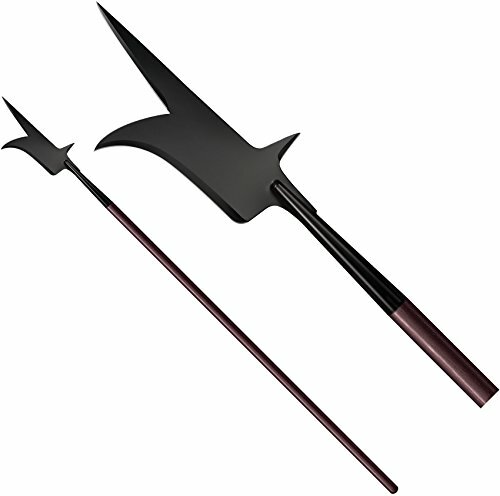 Its next incarnation, with its sharpened edges and hooking blades was fast, agile and ferocious. A good bill in the right hands could hook, entangle, thrust, stab, slice and chop with equal ease and oppose even heavily armed and mounted opponents. An armed force, wielding row after row of these weapons was fearsome to behold! our English bill represents the highest quality battlefield evolution of this formidable tool. With a fully sharpened battle-ready blade spike and hook, supported by an extra deep steel socket and our stout Boar spear shaft.